Chances are, you’ve heard some chatter about telehealth occupational therapy. In fact, you might even know an OT or two who has tried his or her hand at teletherapy. But, for the most part, telehealth OT is still largely a mystery to most of us occupational therapists. There’s not too much information out there, and the little there is tends to be sorely lacking in material we can actually, well, use. It’s a shame that most of us don’t know much about what’s involved—because telehealth is coming, whether we like it or not. Telehealth occupational therapy is going to change the way we practice, and it will impact our profession in ways we have yet to imagine. And the more we know about telehealth, the better positioned we’ll be to leverage it in ways to best serve our clients and help prevent clinician burnout. 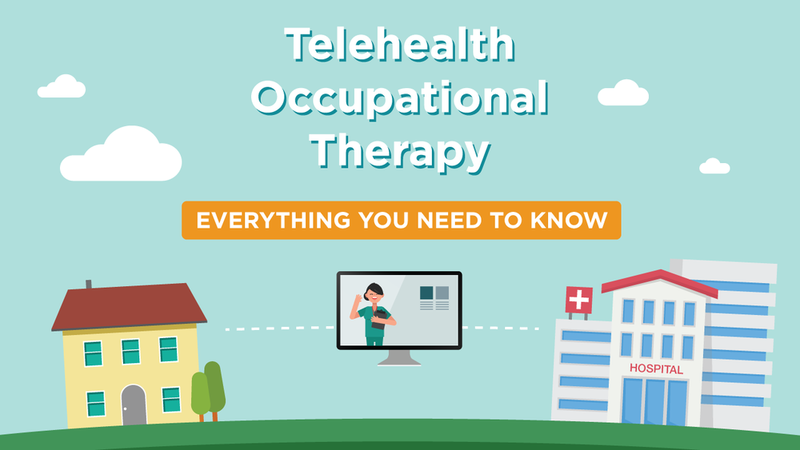 I set out to write this article so that we occupational therapy professionals would have a comprehensive resource on telehealth OT as we know it today, along with some information to help us stay up-to-date with this quickly changing landscape. I’ll update this article regularly as the uncharted world of teletherapy begins to take form. Telehealth refers to medical services provided over a technology platform. Pretty much any form of medical care delivered via technology vs. in-person means can be considered telehealth. That means some of you might already be using telehealth without even knowing it. If you use a secure texting platform to exchange messages with your patients, you’re already using telehealth. If you deliver HEP exercises and updates to your patients, as with MedBridge Go, that’s telehealth, too. If you review patients’ records in a shared health system portal, you’re using telehealth. And if you securely message your patients like on WebPT's HEP platform, yep, that’s also telehealth. Yes! Telehealth can be this simple! This is an example of secure messaging about an HEP program from WebPT's platform. Live video (also called “synchronous”) is exactly what you’d think. Store-and-forward is also called “asynchronous,” and is used to transmit imaging, as well as store and send health records. Remote patient monitoring involves electronically transferring information like blood pressure results or blood glucose levels. MedBridge Go and other forms of patient-facing HEP software are forms of mobile health. At this point, most forms of telehealth occupational therapy will use a blend of these methods to deliver care, so it’s honestly not that important to know the four types. Telehealth was originally devised to bring much-needed healthcare services to underserved or rural populations, enabling patients to receive care when they might not otherwise be able to. But even for patients who can access care, telehealth has its appeal. In today’s modern age of on-demand technomania, telehealth is wonderful option in terms of convenience and, frankly, staying on trend. If other professionals are meeting customers’ demands for on-demand care, why can’t occupational therapists? Consider a post-CVA patient whose son would normally need to drive her to OT, but now she can ask questions and receive teletherapy in the comfort of her own home, and her son doesn’t have to miss work. In any case, teletherapy is great for patient education, management of chronic illnesses, medication management, and more, and we occupational therapists are recognizing ways that we can provide our care remotely, as well. Who is currently using telehealth? Therapists and counselors are using telemedicine to deliver care to address the overwhelming need for increased mental health delivery in the U.S. Surveys have indicated that 43.8 million Americans have a behavioral health crisis in a single year. The scary thing is 60% of those people don’t receive treatment. One of the reasons why telehealth is really taking off in the mental health world is that it addresses the fundamental reasons why people don’t seek treatment for mental illness: lack of access and lack of resources. And, perhaps most importantly, telemedicine delivery is discreet and convenient. Anyone who has experienced a mental health crisis can attest to the fact that real-time, convenient treatment delivered in a private manner is priceless. Preliminary research has shown that teletherapy does show promise in addressing the lack of care for children in geographically remote and underserved areas. Perhaps that is why so many teletherapy SLP providers serve a pediatric clientele. Telehealth SLPs can remotely address articulation and phonology, expressive and receptive language, fluency, voice, and pragmatics. Being a less hands-on discipline than OT and PT, relatively speaking, it’s no surprise that teletherapy has taken off in SLP a bit more quickly. Physical therapists are just starting to use telehealth in an appreciable way. There are several companies popping up that hire physical therapists to treat remotely. At this time, it’s pretty tough to land a full-time benefited telehealth physical therapy position, so many roles are part-time or PRN. However, many traditional brick-and-mortar PT clinics have started incorporating teletherapy into their practice. There is also a growing movement of private, cash-based PT practitioners, many of whom are opting to use telehealth as part of a niche-based practice, if not transferring their services to exclusively telehealth in nature. So where is OT with telehealth? As I already mentioned, some of us use forms of telehealth already. But if you’re wondering who is working completely remotely as a telehealth occupational therapist, the answer is that more and more people are doing it every day. One of the reasons why more occupational therapists have not gone full-throttle and dived headfirst into teletherapy is that Medicare does not currently reimburse for our use of remote medicine at this time. Medicaid does reimburse for OT teletherapy in certain states, and third-party payers are spotty with their reimbursement. This uncertainty of payment has kept many OTs from really digging into the world of telehealth quite yet, but it’s coming. And it has already started in certain niches. As is the case with speech-language pathology, pediatric occupational therapists make up most of the early adopters of telehealth in the OT space. Across the board in rehab, the pediatric world has been one of the earliest to start implementing teletherapy. I was trying to determine why that is, and it may be related to the fact that children cannot drive themselves to therapy. Pediatric teletherapists typically work with children on sensory integration, fine and gross motor skills, visual motor skills, and school-related self-care skills. This care can be delivered via schools (the school sets up the platform and all of the therapy settings, rather than—or in addition to—using on-site therapists. Parents can also book teletherapy from their own homes. For children up to age five, early intervention teletherapy can help provide much-needed caregiver and family education, helping mitigate future academic and social risks. Telehealth OT is a bit like the Wild West. There’s very little consistency between states in the way of laws. Some states have established laws and regulations regarding telehealth, while others haven’t even touched the subject. The AOTA has provided a chart (accessible to members only) that details information about telehealth and OT on a state-by-state basis. Here are some other considerations to keep in mind. HIPAA applies to all medical professionals or healthcare organizations that are providing telemedicine services. According to HIPAA Journal, it’s vital to consider the channel of communication used to transmit ePHI (electronic protected health information). Here are the stipulations, and you’ll notice that they sound pretty close to what we use for non-telemedicine! There must be a system of monitoring communications with ePHI to prevent malicious or accidental breaches. Across the board, practitioners of telemedicine are expected to adhere to standards of care that are the same—no more, no less—as what they’d provide during face-to-face visits. Medicare does not currently reimburse for telehealth services, and Medicaid does reimburse on a state-by-state basis, so you’d need to check with your individual state regarding whether you could receive reimbursement. Another consideration is third-party payers. Traditionally, insurance companies’ reimbursement policies change like the wind, and it’s no different with telemedicine. The best way to find out whether an insurance company reimburses for telehealth OT is to ask them directly. Try to find a contact at each third-party payer you use, and make nice with him or her. That person will become your go-to for all things related to payments in your particular state, for your particular services provided. The pay depends on several factors. Obviously, if you’re a private practitioner, you’ll set your own fee schedule. However, if you join an existing organization as a staff therapist, you’ll likely earn similar rates to what you’d make in a traditional brick-and-mortar clinic. From what I can tell, ranges per hour will be anywhere from $35-45/hour, and in states with higher living expenses, the rates might be higher (how refreshing!). One important thing to consider is that many of these roles are per diem, so you might not receive sick time, PTO, or health insurance. The beauty of telehealth OT is that you can set your own schedule. The other side of the coin is that you might not get all the hours you need, especially if you’re a new grad trying to pay off loans. It’s per diem care at its finest. But this can also be a blessing or a curse, depending on how many hours you need. As of today, there are three ways you can get involved with teletherapy. Here’s how to do each. If you start your own practice, you’ll need to understand state laws where you’re planning to treat, get licensed in the state(s) where you’re planning to treat, set up a business, attract your own patients, get liability insurance, set up a fee schedule, and all that fun stuff that goes along with owning your own clinic. Plus, there’s the tech. You’ll need to figure out the software you’ll want to use, but most solutions make it fairly easy to hang a shingle. If you’re not feeling entrepreneurial, no problem! You can always find a job at an existing teletherapy company. As mentioned earlier, these companies have the same issues standard OTs do: attracting patients, and if they’re cash-based, it’s a double whammy when it comes to the challenges of marketing to patients. That said, they’re hiring and growing, so they’re clearly getting money somehow! Telehealth can be a wonderful ancillary service, and it can also add value to a clinic’s offerings. By incorporating a telehealth wing in a clinic or facility, you will help improve patients’ access to care, and might help decrease cancellations. This would be especially helpful in states where Medicaid is reimbursing OT treatments. If you’re able to convince your workplace to incorporate telehealth into its practice, you’ll grow immensely in your career. Not only will you spearhead a movement to build a program in your organization (which can look great on the resume if you ever pursue non-traditional OT career paths), you can feel proud that you helped bring your workplace to the forefront of a new horizon (cue sci-fi music)! What’s next for OT and telehealth? Only time will tell where telehealth will take us, but we do know one thing: telemedicine is the future. After all, Amazon’s new healthcare venture has alluded to a focus on telemedicine, wellness, and end-of-life care in a recent letter to shareholders. With Atul Gawande at the helm of this powerhouse initiative, virtual health will grow in ways we can only imagine. So whether you enjoy hands-on care or you’re seeking a non-traditional OT role where you use your degree to its fullest, chances are, change is coming. Even if you have no intentions of landing a purely telehealth job, you’ll likely be incorporating teletherapy into your daily practice much sooner than you’d think! What are your questions/thoughts about telehealth? Share them in the comments and I will do my best to address them in future updates to this article!